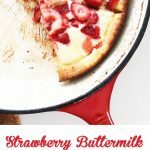 The Strawberry Buttermilk Dutch Baby (Puff Pancake) is an easy and scrumptious brunch recipe! Serve with whipped cream and syrup. 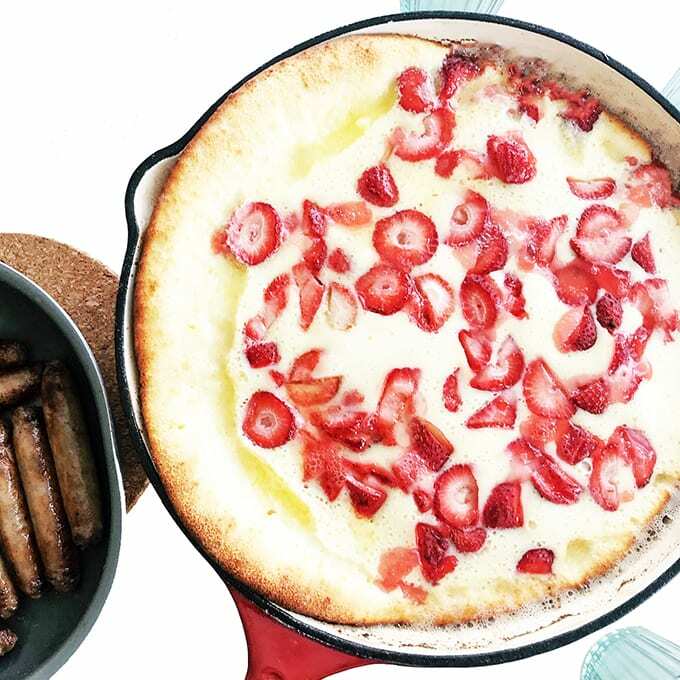 Our obsession with Dutch Baby Pancakes continues…this time we tried something a little different and it was delicious! It’s pretty much the same recipe as we’ve been using for our other puff pancakes, but this time we substituted the milk with buttermilk. Buttermilk lends such a nice buttery and tangy flavour to the pancake, which pairs perfectly with the strawberries and lemon zest. So gosh dang gooooood. Isn’t it gorgeous? 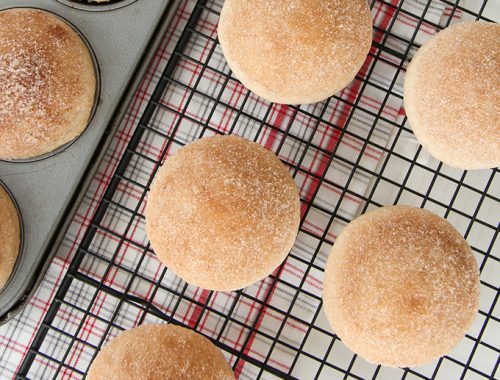 What a pretty recipe for a weekend brunch with family and friends! Serve with whipped cream and syrup. Include bacon or sausages, a selection of fresh fruit and coffee for a nice gathering. This Strawberry Buttermilk Dutch Baby (Puff Pancake) is a simple and delicious brunch recipe! 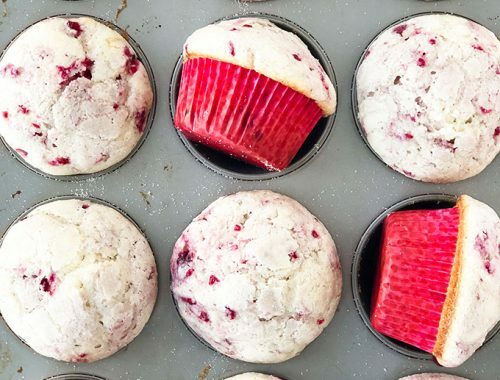 Serve with whipped cream and syrup! 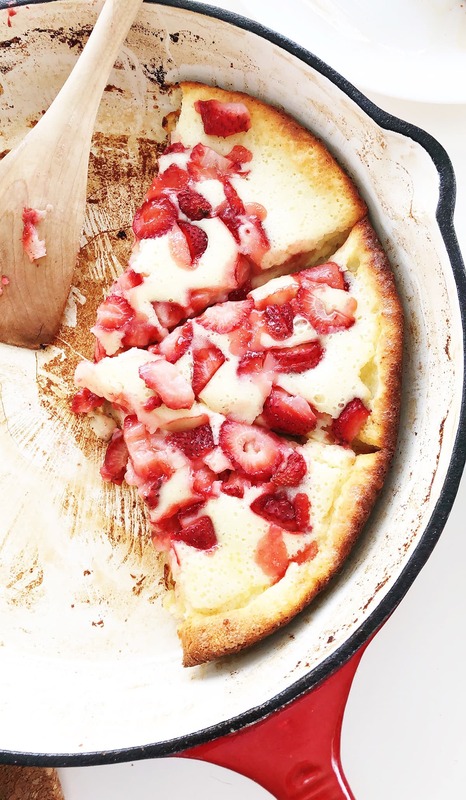 Use a 12 inch diameter pan for this recipe as the batch makes a very large pancake. If you have a smaller pan, feel free to cut the recipe in half. Whisk together the eggs, buttermilk, lemon zest, sugar, salt, and flour until smooth. We actually use a hand blender to make the batter really smooth. Add the strawberries. Don’t stir them in at this point, just add them to the batter. Set aside. In a large skillet (12 x 9), melt the 6 tbsp of butter over medium heat until it is bubbly, and tilt the pan until the butter coats the bottom and sides of the pan. Pour the pancake batter into the skillet and let it cook for about 1 minute, without stirring! Then place the skillet into the oven and bake for about 20 – 25 minutes. The pancake is done when it is golden brown and puffed up. Once the pancake is done serve immediately (while it’s puffed up), because it will shrink quickly!